What would you be willing to do to get reliable guidance on what kinds of content to create more of – and less of – to have greater impact on your business? Would you go so far as to *gulp* audit your content? Don’t click away! Yes, a content audit can seem like an overwhelming task – “something we think is somebody else’s responsibility,” says Cathy McKnight, founding partner of Digital Clarity Group and speaker at the Intelligent Content Conference. “But it is essential to our jobs” as marketers. This article sums up the main points from Cathy’s ICC talk, Executing a Usable Content Audit That Will Immediately Make an Impact on Your Marketing Content. A content audit is a review of existing content. It usually takes the form of a spreadsheet that lists your content assets – all types of content, all channels, all distribution formats – and captures information about each asset. The list itself is sometimes referred to as a content inventory; the audit is the process of assessing each item in the inventory. There’s no universal set of information you should capture during your audit. Consider your project needs and business goals, and assess your content according to what you want to know. Consider both quantitative information (how much, how many) and qualitative information (who, what, when, where, how, why). For examples of the types of information you might want to collect in your audit, see the section – What data should a content inventory include? – in this article. 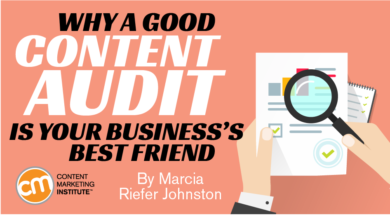 Many content strategists point to the content audit as their best friend. It gives you a high-level view of your content so that you can organize it, manage it effectively and efficiently, keep it current, and make informed decisions about what kinds of new content will probably perform well. When, and how often, should we audit our content? No one remembers the last time you did one. Your content has grown since the last audit. Your content is old, outdated, or underperforming. You are developing a new content strategy. You plan to implement new content management technology. When you move to a new content management technology, content is often the thing that holds up the project. You’re so focused on getting the content system up and running – you’re building it, you’re testing it, you’re looking at the functionality – and then all of a sudden your developer says, ‘OK, guys, where is the content?’ You go, ‘Huuuh! Content?’ It becomes a lift and shift. A shiny new system won’t do you much good if you lift and shift all your old, unaudited content into it. Do your audit first, and make decisions accordingly. What content should we audit? No way around it – you have investigating to do. Talk to everyone involved with your organization’s content. Until you know what kinds of content your organization produces, you can’t make good decisions about which content to audit. What should we do before we start the content audit? Determine where you’re going. What you look for in your audit depends on whether you’re heading into a refresh, a redesign, a migration, or an overhaul. Set up content standards. It’s helpful to have “a baseline of standards that people can use to track the delta” of your content as you move forward. Without content standards, content can’t be governed – and if you aren’t going to govern your content, there’s no point in auditing it. For more on content standards and governance, see How to Get Control of Your Digital Content: Lessons From Intel. What should we do during the content audit? There’s no universal set of things to do during an audit. It’s up to your team to align your audit with your content strategy. 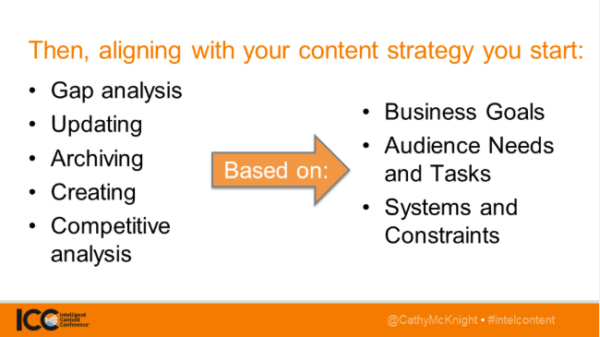 To achieve this alignment, you need to understand your business goals, your audience needs and tasks, and your content systems and technical constraints (as shown on the right of Cathy’s slide below). Then, based on your understanding of these things, you decide what to do during your audit. (Some examples are listed on the left of this slide). Paula notes that evaluating “all content against the same set of goals and guidelines shows where messages are presented inconsistently.” You might want to highlight business-critical inconsistencies so that your team can fix them and put measures in place to avoid similar inconsistencies in the future. If you find wrong content that can easily be fixed, fix it. If you find content that connects to nothing – like orphan pages or microsites – connect or delete it. If you find duplicate content, consolidate it. If you discover that important content is missing, add it. These are just possibilities to get you thinking. Assess the things that will help you fulfill your business goals. Ask yourself what you need to know about your content to support your strategy – what would a successful audit tell you? Dig in accordingly. How do we assemble a team that works? For a content audit team to succeed, it needs a team manager, Cathy says, and it needs members from all stakeholder groups: IT, marketing, the business lines, and so on. Once the team is in place, the company must commit to auditing the content regularly and properly. Cathy likens un-inventoried, unaudited content to a library without a catalog. You can’t manage your content – keeping the whole collection fresh, useful, findable, and relevant – if you don’t know what you have. How often do you audit your content? Who does it? What are the most important things you assess to support your business goals? How much tweaking do you do while auditing? (It seems to me even quick fixes could drag you down to the bottom of a content bog.) Please share what works for you in a comment.